While the first Affordable Care Act (ACA) reporting year is behind us, compliance challenges continue. Now employers face massive potential penalties with less margin for error, and still must wait for IRS final guidance and instructions for the second year of reporting. Stay proactive and prepped with these takeaways from the 2015 ACA experience. The ACA mandates turned out to be far more overwhelming and complex than anyone – including the IRS – had expected. Employers might now start to encounter questions related to their 2015 reporting practices, including the need to address IRS and Marketplace appeals. Meanwhile, ACA reporting obligations continue to change as we move into an ongoing mode of reporting. Not to mention – the ACA itself remains a political hot potato! ACA reporting requirements are still being “tweaked” by the IRS. Understand your complexity and risks. Stay solid by making sure the plan offer includes minimum essential coverage, provides minimum value, and is affordable using one of the 3 IRS allowable affordability tests. Accurate data is the key to successful reporting – the first time! 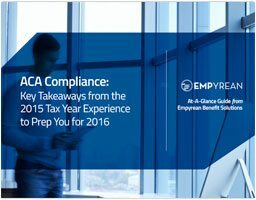 For an in-depth review of the 2015 tax year experience for ACA, we invite you to download Empyrean’s latest At-A-Glance Guide. This guide provides some key information and considerations from the 2015 reporting cycle that can help inform and improve your strategy for next year. Learn how a sound strategy and proven partner can help you alleviate ACA reporting anxiety and achieve success – the first time. As you review your own “inaugural” year ACA reporting experience, we’d love to get your thoughts. Feel free to contact us with questions or comments at info@goempyrean.com.